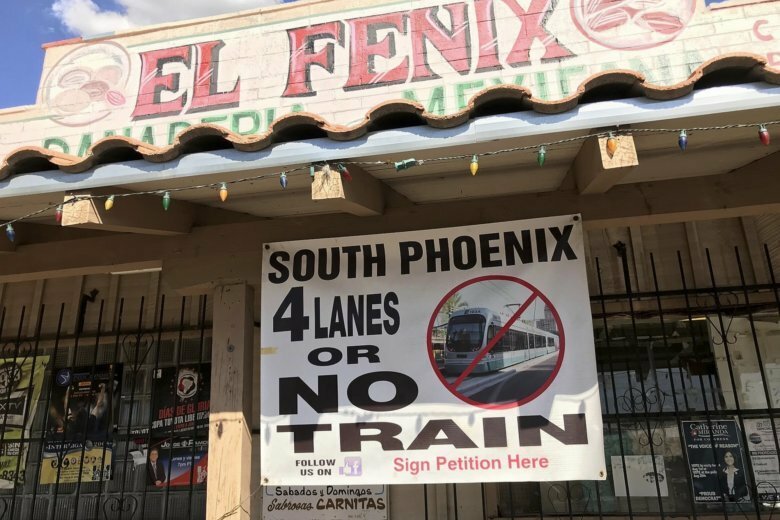 Similar placards are plastered along the proposed new leg of Phoenix’s light-rail system, a plan that progressed quietly until some shop owners in the mostly Hispanic and black community complained that reducing car traffic from four to two lanes on the affected thoroughfare could hurt business. It was discussed for six years, and 55 percent of voters citywide — as well as 70 percent of voters in the two districts it would traverse — approved an initiative to help fund the 5.5-mile (8.9-kilometer) extension. But business owners in this once-segregated area suddenly protested plans to shrink the roadway to two lanes on the Central Avenue route past automotive shops and Latino markets. Some neighbors worried it would bring more crime, push up rents or change the character of their community. Residents of low-income minority neighborhoods often assume they will be bypassed or harmed by such projects, activists and academics said. There are innumerable tales of communities lost to progress: hundreds of Mexican-American families displaced from Los Angeles’ Chavez Ravine, now home to Dodgers Stadium; thousands of people relocated from a black and Polish Detroit neighborhood known as Poletown for a General Motors factory; Phoenix’s Golden Gate Barrio razed for the expansion of Sky Harbor International Airport. “History matters,” said urban planning professor Francisco Lara-Valencia, who takes his Arizona State University students to south Phoenix to study the project. The last-minute protests demonstrate the importance of early input from long-mistreated communities on major projects, transportation experts said. Cities sometimes substitute voter sentiment for true community outreach, said Robert Puentes, president and CEO of the Eno Center for Transportation, a Washington think tank. “Assuming that local communities will sign on can turn out to be dramatically wrong,” added Raj Rajkumar, professor and director at Carnegie Mellon University’s Metro21 Smart Cities Institute in Pittsburgh. But minority groups more often complain they are being ignored for transportation options they need to get to work, school and medical appointments. In Georgia, residents of some majority-black neighborhoods in recent months accused Metropolitan Atlanta Rapid Transit Authority officials of favoring white residents in their plans to expand rail into wealthier areas. The Los Angeles Metropolitan Transit Authority was forced to adjust bus fares and relieve overcrowding in the 1990s after minority neighborhoods complained it was cutting their bus routes even as it spent more on commuter rail to wealthier Anglo areas. When Arizona’s largest city began studying the possibility of light rail in the 1990s, “the people in south Phoenix said, ‘Why are we being excluded? We use transportation more than anyone else,'” said Ed Pastor, a Latino Democrat who retired in 2015 as the area’s representative in Congress. Planners then included the south Phoenix extension. Faced with new protests, the Valley Metro regional transit authority scrambled this month to organize a half-dozen community meetings that each drew up to 100 people. Questions were answered. Written feedback was solicited in English and Spanish. But with a new City Council vote on the project looming this week, some supporters said they fear the project could now be up in the air. Smith said designers opted for two lanes because maintaining four could require the demolition of up to 60 buildings. He insisted that reducing four lanes to two would not slow traffic. “For people to now say they are surprised is erroneous,” insisted Pastor’s successor, Rep. Ruben Gallego. But distrust is high in the community of blacks and Hispanics who were once banned from housing in the white Anglo neighborhoods to the north, said south Phoenix activist Joseph Larios. “The city cited the historical disparities here to get the money, but have otherwise ignored us,” said Larios, whose parents lived in Golden Gate. “We have a lot of people here who cannot drive,” longtime Latino resident Julian Sodari noted. The council affirmed the current two-lane design in June and will review that decision Wednesday. Smith, of Valley Metro, said a council majority has consistently backed the two-lane configuration and voting differently would be a “gigantic shift” that could throw the project off schedule and risk federal funding. Two of the seven members oppose all projects involving the 26-mile (42-kilometer) light-rail system in operation since 2008. Supporters of the extension gathered Tuesday to demand that the extension proceed as planned. “For nearly a decade, community leaders south of downtown have advocated that their neighborhoods should get the same connectivity others have received,” former council member and mayoral candidate Kate Gallego said. City voters in 2015 approved $31.5 billion in transportation funds that included $220 million for the south Phoenix rail extension. Another $150 million from a voter-approved regional proposition and $595 million in federal grants would provide the rest of the nearly $1 billion needed to build it. If it remains on schedule, construction could begin in 2019 and be completed in 2023.